Sn4512 Edwardian mahogany sofa of simple and elegant design, having shaped and satinwood crossbanded top rail, upholstered back and seat and string inlaid arms, standing on outswept legs. This antique sofa retains its original finish, color and patina with new upholstery and top cover, all in excellent home ready condition, circa 1900. Measures: H16"-seat H 30", W 39", D 16" H 41cm, H 76cm, W 99cm, D 40cm. 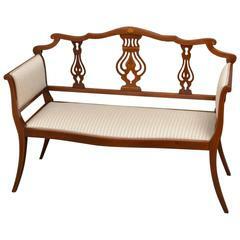 Edwardian settee satinwood with painted work, mid-20th century.